Direct reduced iron (DRI) is technically defined as iron ore which has been reduced to metal without melting it. A DRI production process is one in which the solid metallic iron is obtained directly from solid iron ore without subjecting the ore or the metal to fusion. Major DRI production processes are either gas based or coal based. Feed material in a DRI process is either iron ore sized to 10 to 30 mm or iron ore pellets produced in an iron ore pellet plant. In the gas based plant the reactor, where the reduction reaction takes place, is a shaft furnace. The shaft furnace works on counter current principle where the iron bearing feed material moves downward in the furnace by gravity and gets reduced by the up flowing reducing gases. In a gas based process gaseous fuels are used. These fuels should be able to reform or crack to produce a mixture of H2 (hydrogen) and CO (carbon monoxide) gas. High methane containing natural gas is the most commonly used gas. Natural gas is reformed to enrich with H2 and CO mixture and this enriched and reformed gas mixture is preheated. Coke oven gas (COG) is a byproduct of the coke making process in byproduct coke oven battery. COG consists of a complex mixture of various gases. Its composition typically consists of 55 % H2, 6 % CO, 25 % CH4 (methane), plus small percentages of CO2 (Carbon dioxide), H2O (moisture), heavy tars, volatile hydrocarbons and sulphur impurities. It also contains some N2 (nitrogen). COG is typically used as fuel gas for various heating applications within the steel plant, and surplus COG is used to produce steam, electrical power or is flared. 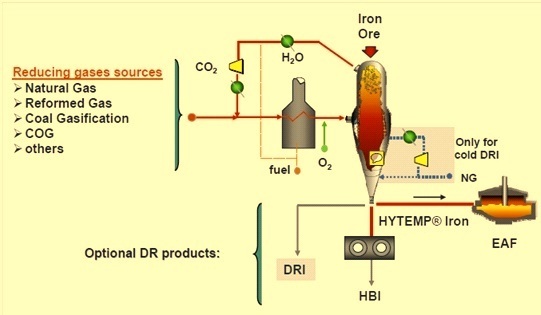 Use of COG for DRI production has always been of interest, but the challenge has been converting the methane to CO and H2 and cleanup of the tars and volatile hydrocarbons. Each ton of coke produced generates sufficient COG to produce one ton of DRI. The production of DRI in the integrated steel route based on the utilization of available byproduct COG is a very recent phenomenon. Use of COG has several advantages both from economic as well as environmental perspectives. Using surplus COG as a reducing gas to produce DRI recovers 97 % of the available energy compared to recovering 30 % to 40 % by burning the COG to produce electric power. The two major processes namely Midrex and HYL have adopted two different approaches for the use of COG for the production of gas based DRI. Midrex first started looking at methods of using coke oven gas in direct reduction in the 1970s. The principal problem involved was the presence of unsaturated hydrocarbons, tars and liquids, as well as high levels of methane and sulfur compounds in the raw gas. The earliest studies focused on conditioning the gas to use as a feed gas component for a Midrex reformer. 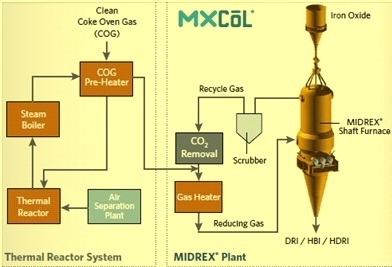 Based upon developments in partial oxidation technology Midrex decided to investigate the possibility of the use of this technology to condition COG as an appropriate reducing gas for the MXCOL process. However the drawback to partial oxidation has always been the necessary addition of steam to the reactants to reduce the soot formation resulting from the oxygen reactions. Around mid 2011, Praxair has developed a partial oxidation technology which they were offering commercially. This partial oxidation technology has unique features which offered the potential to do partial oxidation of hydrocarbons, soot free, without steam injection. When this technology is combined with an extended thermal reaction chamber into which a stream of preheated coke oven gas is injected, the product gas leaving the reactor is suitable for use as a reductant source for direct reduction. All together this equipment grouping, including gas compression, preheating, and reacting makes up the thermal reactor system (TRS). The TRS employs Praxair’s technology for partial oxidation of COG. The system produces an insitu, hot extreme velocity oxygen jet that rapidly entrains preheated COG, reforms the methane, breaks down heavy hydrocarbons, and destroys the tars without the need for any catalyst. Reformed syngas then exits the TRS and is fed into the shaft furnace to produce DRI. During the pilot scale tests, over 96 % tar destruction was achieved along with optimized methane reforming. In addition, operating conditions were developed for avoidance of net soot generation. These pilot scale test results were scaled up in a 1/20th scale demonstration plant at Midrex extensive research facilities in Charlotte, NC. The typical results obtained from the COG demo test operations are given in Tab 1. The two main available TRS options for use of COG are with an MXCOL flow sheet and with a Midrex reformer. Use of COG with the MXCOL process – The MXCOL process was originally developed to utilize syngas from coal gasifiers to produce DRI. The process incorporates the use of a CO2 removal system, typically using an amine solution based removal technology, and a radiant tube process heater to heat the reducing gas and syngas before the furnace bustle. Typical flow sheet of MXCOL process with the use of COG is given in Fig 1. 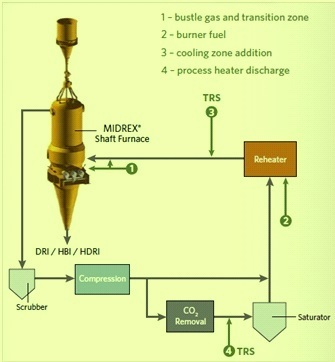 Use of COG with a Midrex reformer – The TRS can supplement the existing supply of syngas needed for each ton of DRI. 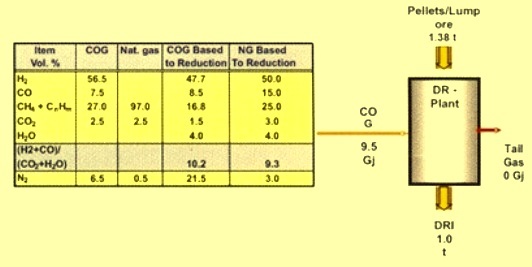 Addition of COG directly in the standard Midrex process flow sheet can be accomplished by adding the gas to either the transition zone or the bustle gas as shown at 1 of Fig 2. In doing this, the met zone temperatures, and the reforming activity of the met zone destroys and converts the tars and volatile hydrocarbons in the COG. However the problem is that when the rate of COG addition reaches a critical point the plant reaches an export fuel condition in which more top gas fuel is generated than what the reformer can consume. COG can also be used as burner as burner fuel (2), but the net effect is that COG supplied to the burners will generate an export of quantity of top gas fuel. The addition of COG in the bustle gas (3) or feed gas (4) can be done using a TRS, which also requires the addition of a CO2 removal system to control the export fuel that would result from the COG addition. As per the current status of the technology, the HYL ZR (Self reforming) process was developed to allow reduction of iron ores in a shaft furnace without external gas reforming equipment. This process scheme has the ability to produce high carbon DRI, which allows producers to obtain maximum benefits of carbon in the steel making process. The recent alliance between Tenova HYL, Techint and Danieli brings a new brand name for this process. The process is now known as ‘Energiron’. In regions where the natural gas is either costly or has low availability, the process can be easily configured to operate using COG, syngas from coal gasifiers and other hydrocarbon sources. Since all reducing gases are generated in the reduction section, taking advantage of the catalytic effect of the metallic iron inside the shaft furnace, optimum reduction efficiency is attained in this process. Thus an external reducing gas reformer is not required. The basic Energiron scheme permits the direct utilization of natural gas. Of course, Energiron plants can also use the conventional steam-natural gas reforming equipment, which has long characterized the process. Other reducing agents such as COG, hydrogen, gases from gasification of coal, pet coke and similar fossil fuels, among others, are also potential sources of reducing gas depending on the particular situation and availability. The flow sheet of the process is at Fig 3. Additionally, the DR plant can be designed to produce high carbon DRI, hot DRI, which can be directly fed to adjacent EAF through the HYTEMP System or to briquetting units to produced HBI or any combination of these products. The overall energy efficiency of the ZR process is optimized by the integration of high reduction temperature (above 1050 deg C), ‘in-situ’ reforming inside the shaft furnace, as well as by a lower utilization of thermal equipment in the plant. Therefore, the product takes most of the energy supplied to the process, with minimum energy losses to the environment. The process allows attaining carbon levels up to 5.5%, due to the improved carburizing potential of the gases inside the reactor and most of the carbon is present in the form of iron carbide. Even though the chemical compositions of COG and natural gas (NG) are quite different, COG can be used directly in the ZR process with the same basic configuration, actually, the gas composition entering the reactor is very similar as indicated in Fig 4 for both ZR based on natural gas or ZR based on COG. Typical requirement of COG for DRI production, based on the HYL- ZR process is about 9.5 GJ/t DRI, for a DRI of 94 % metallization and 4 % carbon.